Anything is possible, especially in Las Vegas, but what about UFOs and alien visitation? For an experience that’s not entirely of this world, consider making a day trip up to infamous Area 51, a restricted military base shrouded in secrecy and swirling with varying theories about its classified activities. An all-day pilgrimage to this “non-existing” location can be a great experience for those who have a fascination with extraterrestrial life, love pondering conspiracy theories or just want to see the desert landscape north of Las Vegas. Although the existence of Area 51 was denied by the U.S. government until 2003, conspiracy theorists have long speculated about strange happenings in and around the base. Alleged top secret occurrences include the storage of UFOs and dead aliens, meetings with alien life and teleportation. Many locals and other amateur investigators claim to have made UFO sightings here. This folklore has been famously portrayed in the film “Independence Day” and TV show “The X-Files.” Central to Groom Lake, the CIA’s official name for Area 51, is Homey Airport, where the testing of experimental aircraft and weaponry allegedly take place. While civilians are not allowed inside this Restricted Area, with the right directions you can get pretty close. Tour companies also offer guided day-trips up to Area 51. An excursion can last anywhere from 7 to 9 hours, but thankfully, there are some interesting places to stop on the way. Located nearly 150 miles north of Las Vegas, Area 51 cannot be found on any official government map. 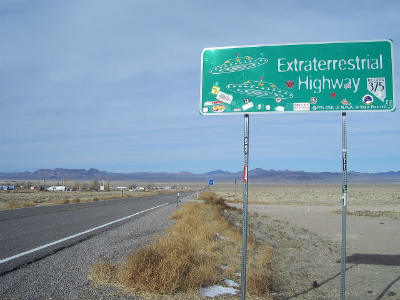 To get there, one must travel down Route 375, which was officially designated Extraterrestrial Highway in 1996. There are plenty of photo opportunities on this 98-mile stretch of road, including signs that read "Extraterrestrial Highway 375" and "Speed Limit Warp 7.” Much of this area is free range, which means cows or other cattle could wander on to the road. Please exercise caution as ranchers may require compensation for any harmed animals. Before reaching the Extraterrestrial Highway, be sure to check out the dry lake in Alamo. Located on the way, the Alamo dry lake features rocks painted with ancient Native American petroglyphs. Some say these images provide documentation of ancient alien sightings. Alamo and nearby Ash Springs are also home to the last gas stations you’ll see on the trip. From there, consider taking a brief side trip to Hiko (only about 10 miles out of the way) to visit the Alien Research Center. This roadside museum attraction perpetuates the mystery and fascination of Area 51, allowing guests to read “top secret” documents and pick up some evidence of the adventure with some fun Area 51 memorabilia. 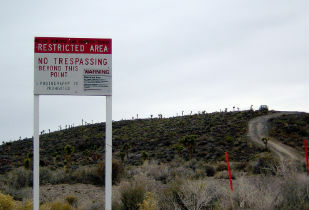 True to the top secret destination that it claims to be, there are no signs indicating that one is heading toward or arriving at Area 51. 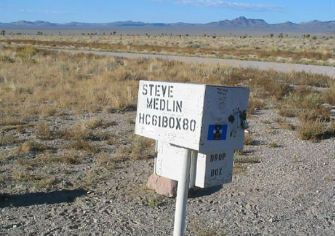 Once you reach the Extraterrestrial Highway, the proper turnoff is marked by the famous Black Mailbox. This mailbox, which is sometimes called the “Alien Mailbox,” is not actually black but painted white and covered in graffiti. A local rancher allegedly set it up to give enthusiasts a place to leave letters for our other-worldly visitors. Turn down this road and travel through a bizarre Joshua Tree forest to arrive at the perimeter of Area 51. If you’re lucky, you may see some “men in black” in SUVs parked on the hill. These are the employees of Groom Lake being escorted to work. Just so there is no mistaking that this is indeed a classified military base, heed the warning of the signs stating that use of military force is permitted. For those who want to go a bit off the beaten path, look for the back gate, which is said to be even more mysterious than the frequently visited perimeter. It is about 8 miles from the main gate. 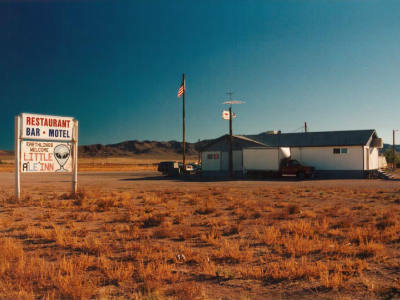 The town of Rachel, which is about 20 miles north of the Groom Lake turnoff, is the closest place to find lodging and food. While there is no gas station in this town of less than 200, one can find the famous Little A'Le'Inn in Rachel. This unique motel and restaurant is the kind of place where there’s always a local around willing to share strange sightings stories. As the sign says, “earthlings are welcome” to stop in for a cold beer and delicious Alien Burger or check out the gift shop. Twelve rooms and a few powered RV spaces are available for an overnight stay.